I didn’t really act upon it until a few weeks ago when I drove to Prescott, AZ with my girlfriend for a weekend getaway at the cabin. We drove there in my 2000 540i Touring, which had no trouble driving on the highway there but got a little sketchy on the less-than-perfect roads. Low profile 18" tires do not make for good mountain road driving. They do make for some excellent pictures, though. Bright red car + beautiful forest = incredible pictures, guaranteed. While driving around the forest, I saw a gentleman that had a mint-condition Range Rover parked in what had to be one of the most beautiful log cabins I’ve seen in a long time. I wish I took a picture, but that would have definitely seemed a little creepy. I do remember thinking that I wanted a Range Rover, so while we were getting breakfast in town I hopped on Craigslist, as I am apt to do. And there it was— a 2004 Range Rover HSE listed for only $3500 in non-running condition. My brain instantly went into a manic car-buying mode, as it always does whenever I see a good deal on Craigslist. The ad was up for three days at that point, so I wasn’t sure if it was still available. 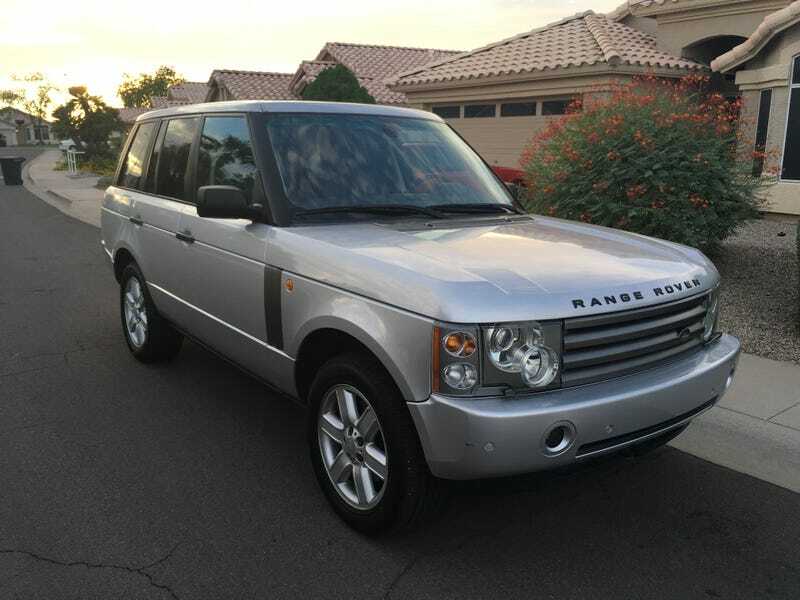 Figuring that it couldn’t hurt to ask, I texted the seller on my way home from Prescott, and he informed me that the Range Rover was still available. Not wanting to waste any time, I set up a time to view the Range Rover that same day. I figured it would be totally trashed, but it definitely wouldn’t be available for very long at that price. As soon as I got home I dropped off my girlfriend, picked up my fuel pressure test kit, and drove off to see the Range Rover. It was about an hour drive from home on the other side of town, and that was after 2+ hours of driving back from Prescott. For what it’s worth, my 540i Touring didn’t skip a beat, faithfully transporting me on my adventure. When I finally showed up at the seller’s house, I saw it. And it was glorious. It was pretty dirty from sitting outside for a few months, but it was all intact. Most importantly, it hadn’t been messed with, being 100% original and stock. Take a look on your local Craigslist, I bet you’d be hard-pressed to find a 2003-2005 Range Rover that doesn’t have giant chrome wheels. I tried starting the engine, and it roared to life for a little bit before sputtering and dying. Suspecting a bad fuel pump, I ran a fuel pressure test using the Schrader valve on the engine’s fuel rail. Sure enough, it reported a maximum of 20psi, quickly falling to 10psi. According to manufacturer specs, the minimum fuel pressure should be 30psi for the engine to run properly. I was 99% certain it was the fuel pump, so I decided to take the risk and bought the Range Rover for around $3000. A little backstory on the Range Rover— it had 158,000 miles and only two owners, with the first owner having it from 2004 to 2015. The second owner bought it and could never get it running so it just sat in his driveway. It was originally sold in Georgia, lived in Tennessee for most of its life, and then it ended up in Arizona when the original owner moved here with it. I confirmed all of this via an Autocheck report. This means it’s completely rust-free, which I confirmed by looking under the truck. Not a single spot of rust anywhere. The fuel pump assembly. The fuel pump itself is the small silver thing in the middle. It arrived at my house the next day on a flatbed, as all good projects do. I ordered a BMW X5 fuel pump from my local parts supplier, since these 2003-2005 Range Rovers had the same exact BMW M62tu engine that the 540i/740i/X5 had. The fuel pump was around $150, and took a few hours to swap out because it involved removing the rear carpet and disassembling a rather complex assembly. After swapping out the fuel pump, I primed it a few times and turned the key, hoping for the best. At that point it was 5am and I had work the next day, but I was way too excited to go to sleep so I took the Range Rover on its first drive in months. Everything worked perfectly, with no check engine lights or warning lights. Needless to say, I was excited. The next few days were a bit of a blur as I had another project I was working on, but I do remember that I passed emissions very easily with the Range Rover. I got it registered/titled/plated for around $150 at a third-party DMV office. It took me 5 minutes total— I love capitalism. Last weekend I gave it a really good detailing, which allowed me to assess the condition of the paint. I washed the whole truck with dish soap and clay barred it all around, cleaning off years of neglect. With the paint fully cleaned, I saw that it was all in pretty good shape, with only a few minor rock chips on the hood, as expected from a 12 year old vehicle with original paint. There were swirls in the paint that I’ll take care of in the future, but for now I waxed it all to protect it from the hot Arizona sun and hard water rains. Finishing it all up with some nice tire shine, the Range Rover started to resemble the proud truck that it was in 2004. I’ve been daily driving it for a bit now, and I’ve had no problems with it. The gas mileage has been pretty mediocre, but that’s to be expected. I will say that it is a good bit faster than you’d expect a 5300lb box to be. The air suspension works perfectly, which is a nice bonus. Of course it’s not all tea and crumpets; there are some minor annoyances which I’ll detail in my next post. Ultimately, we’ll see what my maintenance costs end up being. Should be interesting to see how they compare to Doug’s Range rover. I anticipate that they’ll be fairly low, since I can do literally all the maintenance and repair work myself in my garage. So what are you waiting for? Get out there and find yourself a cheap (un)reliable car/truck! Part 1 - The First 2k Miles In The Nation&apos;s Cheapest Range Rover. Part 2- America&apos;s Cheapest Range Rover Update.